Firefighters make headway over week as rain and snow covers region. Wildfires in both Kansas and Oklahoma have burned an estimated 397,420 acres total across the two states, but recent reports suggest that the number now exceeds 500,000 acres, according to Oklahoma Forestry Services officials. Firefighters were able to make headway over the weekend in controlling the wildfires, aided by light rain and several inches of snow. 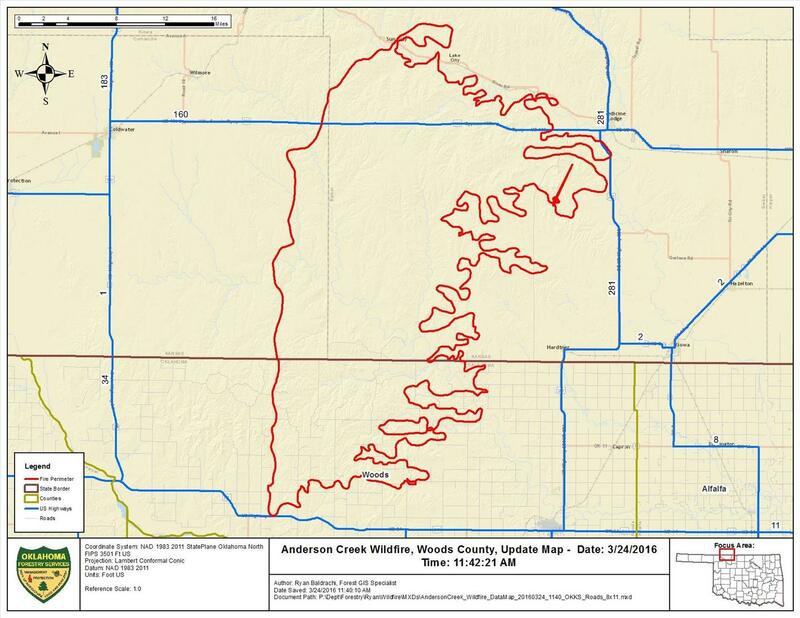 Emergency officials were fearful, however, that the high winds forecasted for March 29-30 could hamper efforts and possibly rekindle hot spots, the Kansas Livestock Assn. (KLA) reported. “Ranchers in the area continue tending to the health and feed needs of cattle. There were some cattle casualties, but no official count is underway. Many surviving cattle are suffering from respiratory problems due to smoke inhalation, according to producers and veterinarians. Some were directly injured by fire,” KLA noted. KLA said most fences were destroyed in the fire, with wire laying on the ground where wood posts were burned. The largest wildfire started March 22 in Woods County, Okla., but has since spread to several counties in Kansas. A new wildfire several counties northeast of the biggest blaze started Thursday in Harvey County, Kan. Also, on Friday morning, the National Weather Service issued a red flag warning — which means conditions are ideal for wildland fire combustion and rapid spread — for western counties in Oklahoma. Strong winds associated with Winter Storm Selene blasted across the Plains on Wednesday, which combined with low humidity to make for dangerous wildfire conditions, according to Weather.com meteorologist Chris Dolce. Conditions were expected to become more favorable for firefighters as the weekend neared, giving them a better chance to gain control over these infernos. It said crews continue to focus primarily on protecting residences and outbuildings. “The terrain in the sandhills is difficult to maneuver. Fire units and responding vehicles continue getting stuck in the marshes and sand,” the sheriff’s office said. A report from the sheriff’s office Friday estimated that a combined total of around 14,000 acres had burned within Reno and Harvey County. Last Thursday, KLA posted a need for hay donations for ranchers in the affected areas, reporting that an estimated 100,000 acres, along with hay reserves, fences and other personal property, had burned in Comanche and Barber counties. By Friday, those needs had been met, but fencing supplies were still needed. “Due to an incredible response in the first few days after the fire, hay needs of area ranchers have been met for the time being,” KLA said Friday morning on Facebook. On Monday, KLA noted that monetary donations are still need to cover fencing supplies, animal health efforts and other needs. Kansas Gov. Sam Brownback declared a state of disaster emergency March 23 for areas threatened by the wildfires. The declaration authorized state resources to assist communities affected by the fires.